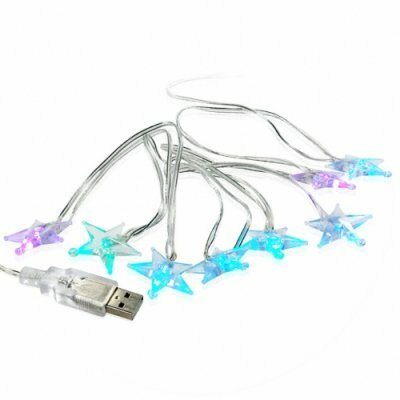 Successfully Added Crystal Sparkling Color Stars - USB Holiday Lights to your Shopping Cart. Sparkling stars light up in seven bright colors to help celebrate the holiday season. Why have a plain old computer monitor or desktop plant when you can have a multi-colored wonderland? These USB powered crystal lights cycle through seven bright hues to keep the holiday season merry even if you are stuck inside in front of your computer. Also a great way to decorate a window or attract attention for your business. All that is needed is a simple USB port to plug into and you can start making the holiday come alive. Brilliant USB powered holiday colored lights. Sparkling stars gradually cycle through seven brilliant colors. When off, look like crystal stars. When on, look like colored stars. Ho Ho Wholesale Limited Stock: Hurry - order your Christmas products early before Santa's China warehouse runs out!